As promised on Monday I am adding these two pathways again, in a different format, and in the hope they are able to be read. 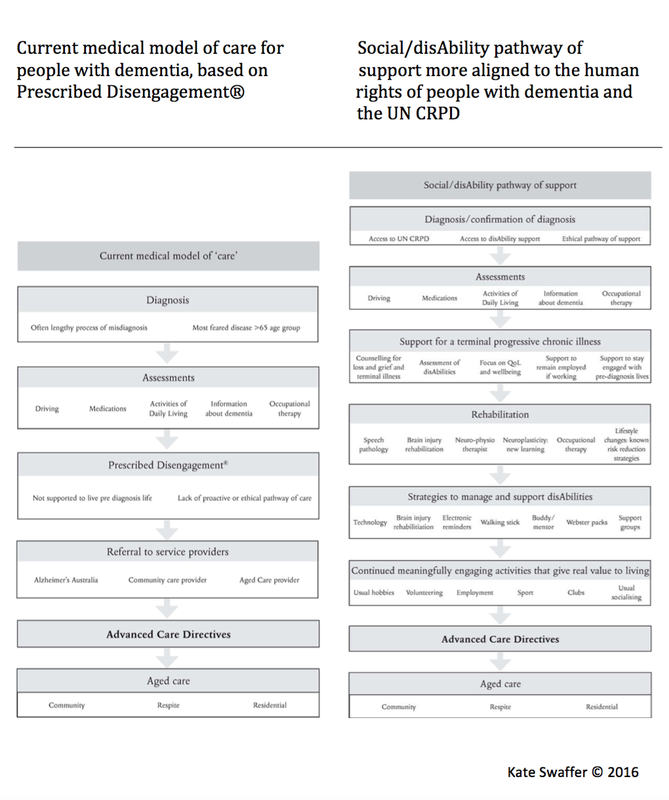 The first is the Medical model of ‘care’ currently still offered as the post diagnostic pathway to people with dementia, which simply supports Prescribed Disengagement® alongside the following is the Social/disAbility pathway of support, as self prescribed, in part after receiving support from the Disability Advisor of the University of South Australia Magill campus, and their providing me with strategies to support my symptoms as disAbilities. This is in line with our rights under the UN CRPD. Let me know if these are able to be read!! If not, perhaps you’ll need to buy the book… it is very inexpensive on Kindle. Reblogged this on Doctor Dementia and the Dementia Adventure. Thanks for trying again but unfortunately it’s still a struggle. Like many more I would like to use this but can’t at the moment because it is barely legible. My darling BUB is redoing it, in a format and size that I promise will work!